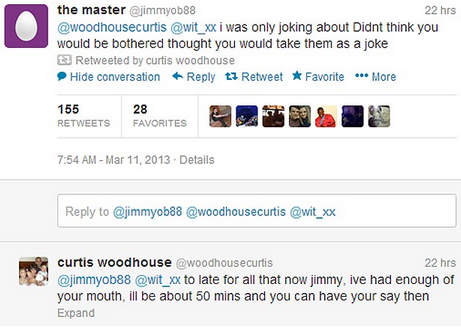 A cocky twitter troll has had a surprise visit from UK footballer turned boxer, Curtis Woodhouse, after the user, @Jimmyob88 reportedly verbally abused him over the loss of his English light welterweight crown. After being publically called a “complete disgrace” and “laughable joke”, Woodhouse decided to make the consequences of the trolls actions hit hard, offering a reward to anybody who could provide him with the real life name and location of the troll. On March 11 he tweeted “just on my way to Sheffield to have a little chat with a old friend, get the kettle on @jimmyob88 #boxing #football #sillysillyboy“. 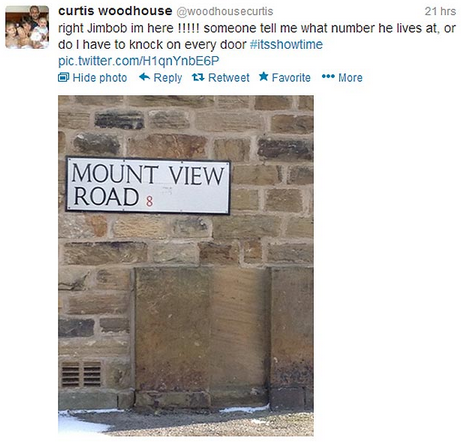 After tweeting an image of @Jimmyob88’s street sign, Woodhouse received a tweet from the troll telling him he was joking the whole time. “I was only joking about Didn’t think you would be bothered thought you would take them as a joke” @Jimmyob88 wrote. It is reported that Woodhouse found his way to @Jimmyob88’s residence, however no one answered the door so he went home. “Just found out you can block people. Could have let me know earlier, I could have saved 20 quid in petrol”. @Jimmyob88 “The Master” has deleted all twitter activity up until late February this year. Curtis Woodhouse met with twitter abuser, identified as James O’Brien on UK early morning news programme, Daybreak earlier today.